What’s trending in wedding entertainment now? Couples have always wanted their guests to have the best possible time at their wedding. But there are some trends creeping in for entertaining guests at a wedding and we thought we should share these ideas with you. Hand out sparklers to guests at the entrance to the wedding reception venue so they can ‘light the way’ for the couple. The guests line up each side of the entrance and form a sparkler-lit passageway. You could also do this if the couple leave their wedding later on to go on their honeymoon. It works best at an evening wedding because you need the darkness to show up the sparklers but it’s effective and makes for wonderful wedding photographs. Okay, okay. So we know everybody does photobooths these days (which is not to say they are a bad idea by the way). But there are some new ways for your guests to take their pics. 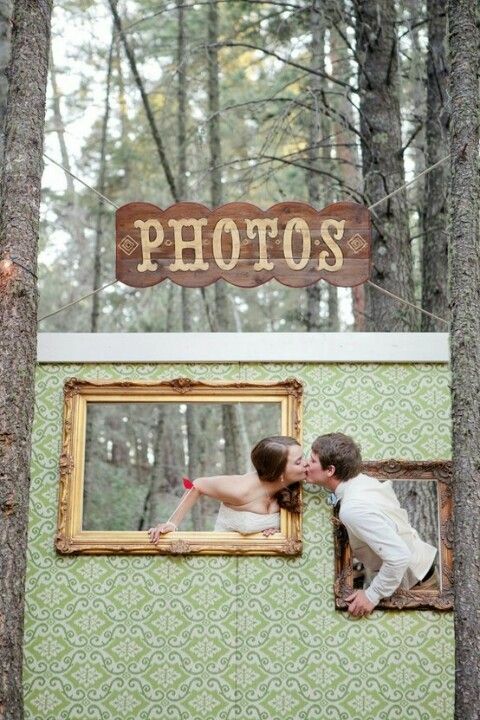 Look at the idea above for a photobooth with a twist. It’s basically a cut-out with frames for your guests to get creative with. Alternatively you could hang frames from a tree outside or a bar inside for guests to take selfies! Put some quizzes at the place settings at your reception so your guests can have some fun. The pair of you are likely to come across some interesting reading afterwards and in fact, the answers could always make part of a wedding speech! Don’t forget to put some on the children’s tables too, they may come up with the funniest answers and they’ll feel part of what’s going on if you include them. You could also do an i-Spy quiz (this is a great one to keep children entertained). Think about what you’d like guests to spot. It might be a painting on the wall at the reception, a blue wedding hat, a spotty tie – be a bit creative. Keep things simple if you want to keep the kids interested and be sure to have a prize ready for when children have completed their quizzes. Just about everybody loves watching ‘Strictly’. One new idea we’ve heard about is a professional dancer teaching a v short and simple routine to a few guests so that they can then strut their stuff on the dance floor. It needs to be a very easy dance and take no longer than 30 seconds but it’s guaranteed to get your guests involved! Have a serve yourself cocktail bar? Just make sure you keep the youngsters away from this one! Have a cocktail bar set up with different juices, stirrers and two or three cocktail bases so that guests can make their own drinks. Or better still, have a cocktail barman shaking up some delicious numbers! Karaoke is an old one but it’s a really good one. If you’re going down this route, then we’d recommend that you do it in short bursts of 10 minutes or so – don’t let it overtake the evening. Or if room permits, you could have a karaoke ‘bar’ in a separate room. Everybody who wants can join in even the kids and it’s certainly an ice breaker! Finally, one entertainment that’s best avoided is having sky lanterns. They may look pretty but they’re banned in a lot of rural areas now because of the danger they can cause to livestock so give these a miss.